Do you find it hard to rely on your current Internet team/contractors to get the product out on time? Are your web products generally over budget? Does the cost of software development make it too hard for you to compete with other web companies? Do you prefer to not have to worry about staffing issues - such as finding, keeping and paying staff? Would you like to maximise your returns and minimise your efforts? Do you enjoy helping small to medium sized businesses maximise their website strategies and achieve tangible results in their business? Do you want to be part of the biggest change to website development since the creation of the Internet? Would you like to market the most advanced and revolutionary software available in the world? Do you want to build a business that can earn a residual on-going monthly income from hosting and license fees? 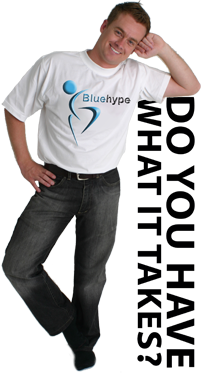 Bluehype Resellers experience the best of both worlds. You can offer the most advanced web and software products and services to the market without the overheads, stress or inconvenience. Plus, we make it easy to manage and grow a successful business. By utilising our tools, systems and strategies, you will sell more products to more customers in a shorter period of time. Click here to find out some of he benefits of working with Bluehype.